I seem to be lacking any reference material for the way that Viking Scabbard beltwork was worn and attached,is there anyone here who could point me to a good resource or has any pics they could share on the matter? There are no clear surviving scabbards from the viking age that show how they were carried. It is indeed a muddy water! We have to draw conclusions from depictions in art (manuscripts that are contemporary as well as nordic picture stones). In art details are more hinted at rather than clearly represented. from Gotlandic picture stones we see that the sword is depicted as being worn rather high and at an angle, 40-45 degrees. These are the ones I´ve seen. There can well be other stones showing something else. From the manner the sword is carried, as shown in stylized art of scandinavian context it seems there is a similarity as to how the sword was worn during the migration period, as shown in artwork embellishing helmets (Vendel, Valsgärde and Sutton-Hoo). Scabbards from this period have a late version of the scabbard slide method and what looks like a baldric. A viking age scabbard find from Hedeby shows remains of what can be a scabbard slide. I have myself seen a well preserved viking age scabbard during conservation. A rare find with remaining leather or textile covering. There was no trace of any mounts or slits to give a clue of how it was attached to any kind of straps or belt. Perhaps we have to think of ways to attach the scabbard to the belt that does not leave any traces in the scabbard itself? I do think that slits in the covering leather would have been in use as well. The illustrations from Alfred Geibig´s book that Jeroen posted clearly suggests so. No finds that I know of provide any clues. If we turn to the earlier period to look for clues we are slightly better of (late roman to migration period). 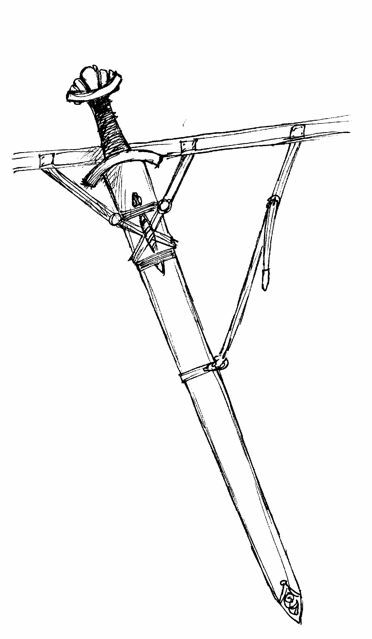 I attach a few drawings from the book "Das Schwert im Fruhen Mittelalter" with reconstructions of methods of suspension. These could be the basis for educated guesses, at least. Remember that any solutions should probably not include metal mounts on the scabbard (ecxept possibly a chape at the point end) that would leave traces in the find material. Rather organic slides (wood, leather or bone) and lace work or knots in different combinations, possibly also including slits in the scabbard cover material. Note that the illustrations attached show suspension methods that was in use several centuries before the viking age. I include them as they show similarity to the illustrations in art from the viking period as shown in the illustration from Alfred Geibig. The belts themselves can have mounts and buckles of bronze, iron or silver. 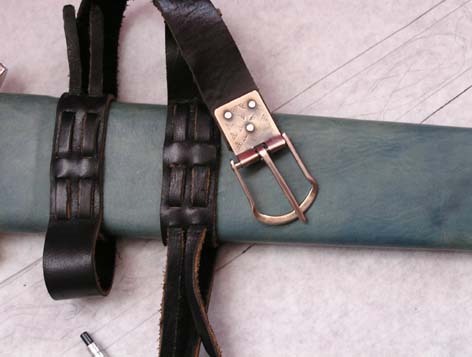 It is the attachment between belt and scabbard that remains a mystery. Based on the work by A Geibig and comparing to earlier styles of suspension methods Aaron and I developed a few designs for the Arn film project. The scandinavian warriors are described in the book as using swords of viking age type in the 12th C Sweden, so we were left with that anacronism. We still wanted that the viking swords shown in the film would be accurate viking swords, so that posed some questions as to what scabbards they should have. The following sketches show some concept ideas. remember these are for film swords that are to be as accurate as possible within given limits. They are not historical reconstructions developed for a museum. Still they might give you a hint of what could have been. Peter,thank you for taking time to post this,there are some very interesting ideas there which are very helpful.Strange to realise that there is actually no definitive answer to the question,but more in the way of suggestion,i think that i can get a fair idea of a couple of possible methods,on the presumption that stitching was not used where thonging or threaded beltwork would do the job. the scabbard tab seems to be the point of attachment,and probably where that is not present just crossed and bound beltwork would do ,at least its one area where people cannot jump up and down shouting 'thats not authentic'.I presume that you need to put yourself into the place of someone wanting to simply attach a Scabbard securely and comfortably by whatever means were available to them . thank you again for generously sharing your knowledge. The volcanic soils of Iceland are not kind to artifacts, but there is a sword scabbard with one iron band from grave 4 at Sílastaðir, with photo in Eldjárn’s “Kuml og Haugfé” (catalog of the pagan graves of Iceland). This picture is of a sword from a burial at Ballataere (isle of Man) and shows clearly the remains of a baldric. The text says "Around the body were placed a ritually broken sword in its scabbard, together with a baldrick...."
Yes, that's the one that I was trying to think of. Christian Fletcher makes a repro of it. Very happy to learn about that! Why do you think it is described as a baldric? Why could it not be a sword belt (affixed to a slide-ish mounting) with an extra lower attachment point? What is interesting is the metallic mounts being used. Honestly, I thought of it as a baldric because of the accompanying text. I don't know if other components related to a baldric were found. And you are right, looking at the picture it could be a belt with a lower suspension point. Something just like your Ulvsbane drawing. The baldric here is close to those by Christian Fletcher and , at least for me, looks rather convincing. The nice thing about Icelandic finds is the people moved there as Vikings and stopped burying grave goods when they converted to Christianity, so if it was buried with a human on Iceland it is gen-u-ine Viking, 10th century. Is it my monitor, or is the scabbard to which the baldrick is attached in the manning link hot pink? Is there a trend in fuchsia-clad Vikings somewhere? Does anyone have pictures of their reproduction scabbards/belts/baldriks? I am starting to gather information to make one myself, would enjoy any further input. I would like to bring attention to this amazingly informative thread again, and thank Peter for the pictures and resources! This will make my first customization project that much more historical. myArmoury never ceases to amaze me, and I am ever learning new and intriguing things. There are several Viking era scabbards in Dublin, if you have or can get a copy of the book "Scabbards and Sheaths in Viking and Medieval Dublin" you can see detailed drawings and pictures showing the originals. Three of them have the same method strap bridge. 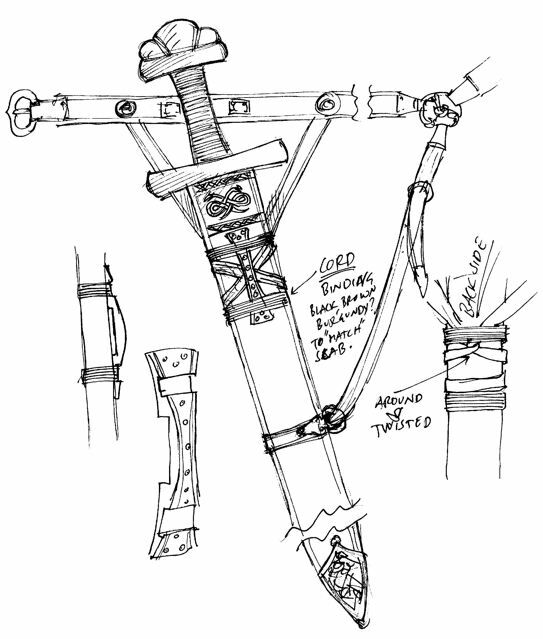 A non-ferrous fairly thin metal bridge is attatched to the wood core on the front of the scabbard the bridge and core are then covered by thin leather and a slit is made on either side allowing a band to pass through. Question early middle ages scabart is for my transparent in our area :-) but about accessories is problem finding some evidences. 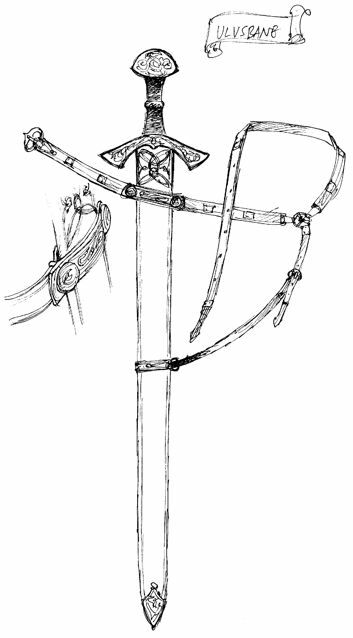 In research of early meddle ages scabarts and swords was in Czechoslowakia are good potential. There was many excavations of rich slawic sites. Academy of science have to publish paper obout 19 swords from Great Moravia funeral excavation. 19 swords with scabbarts and hilts in very good condition, it is fenomenal sample local and Rhine production. For exampel hilts have hed wood hilt with cord uneder leather. Scabbarts have more than 4 leyers. One leyer by blade was textil (?) following layers was several wood and different textil and pelt. Kouril P.: Die Fruhmittelalterliche Elite bei den Volkern des Ostlichen Mitteleuropas. Material der International Fachkonferenz. Mikulcice 2004. Archeologisches Institut dre Akademie der Wissenschaften der Tschechischen Republik Brno 2005.